Mondo Surf and Lifestyle Village is a small peaceful resort tucked away in Canggu that is both a relaxing escape and true experience into the local way of life. Mondo’s really embodies a village type atmosphere with all guests starting off each day by sharing a healthy breakfast together followed by fun adventures such as surfing, yoga, photography and martial arts. The location was close enough to the beach, tasty local restaurants, and Canggu nightlife, but just far enough away from the downtown to maintain a quiet ambiance. With an incredible in-house kitchen, family-like mentality, and tons of daily activities, Mondo’s was a perfect little Balinese getaway. There are only an intimate number of villas surrounding the main "common area", all connected by a beautifully laid out path and surrounded by rice fields and palm trees. I loved the fact that even if you come alone, you are sure to make friends, especially as during breakfast, everyone heads to the common area and shares one long table. There is also a yoga area, bar and pool/lounge area. Each villa is adorned with its own hammock, which I used excessively. Canggu is a nice little beach town next to the bigger and faster Balinese cities of Kuta and Seminyak. However, Canggu holds its own with the variety of cafes, beach bars, and delicious spots to grab a bite. Long black sand beaches at its front and endless rice fields at its back, Canggu is an ideal village to explore. Mondo’s is positioned next to a rice field just on the outside of one of the main roads to the beach. We were able to take free bikes or motorbikes to go adventure into town and there is sweet shortcut through the rice fields that take you right into the downtown. Mondo’s takes care of you when you want to stay in for a meal or drink, not to mention gets you going on a balanced breakfast every morning. 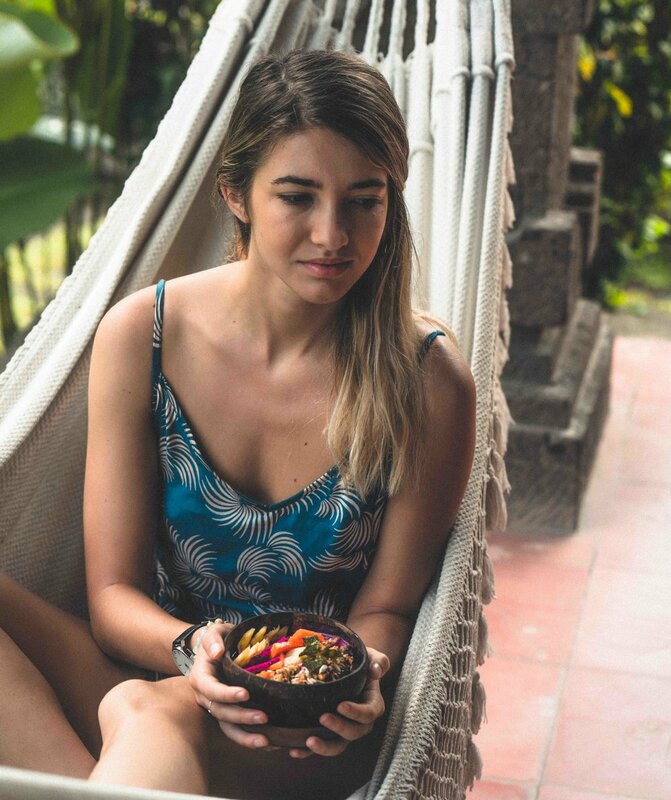 Smoothie bowls packed with fresh fruit and granola were my go to, along with the traditional (and strong) Balinese coffee. We could also grab a classic Indonesian bite or a drink by the pool at any time with incredibly friendly staff making sure we were enjoying our stay and felt at home. The Mondo Surf and Lifestyle Village is a perfect spot to learn how to surf, try out some daily yoga, and get some martial art experience. You can also learn a thing or two about photography from a professional photography to truly capture the memories on your adventures. The teachers of all the activities are incredibly passionate and sincerely love what they do, which makes the experience that much more enjoyable. This place is not your typical small resort. They pul; guests in with genuine love and happiness to spread the “Mondo Lifestyle.” I definitely recommend Mondo’s to those looking for a calm yet exciting adventure in Canggu!